Could it be? Could this be the end of the 3rd snowiest winter in area history? Well I certainly hope so ‘cause our department is hurtin’! Cold temps, sleep deprivation, and spending just a little bit too much time with co-workers can be taxing. Great googly-moogly! The kid down the street from me, who made more money than ever shoveling driveways and sidewalks around the neighborhood, was complaining that his back hurt! At this point, I say good riddance to the white stuff! 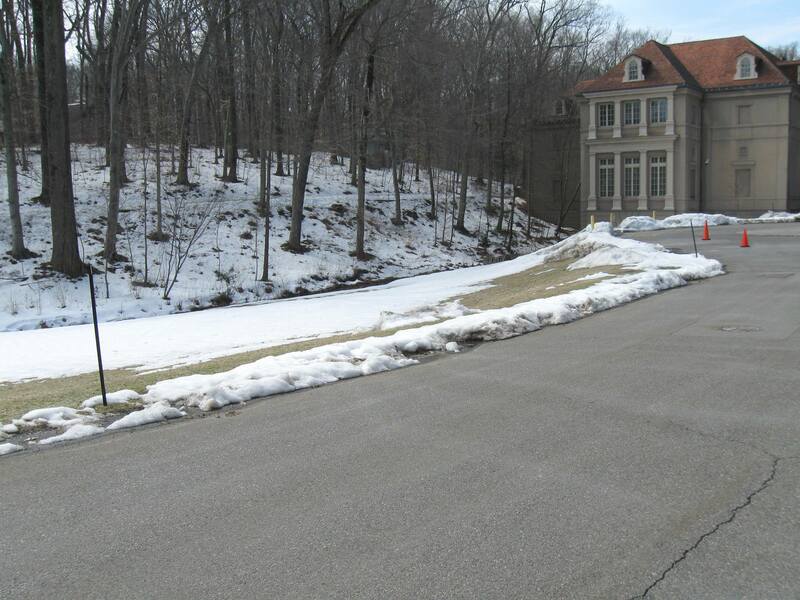 Snow is melting on the sunny slopes, at Winterthur and I’m thinking seriously about taking down the snow fence and the road markers. But that melting snow is uncovering a few (not so surprising) damaged areas. Plows and salt took their toll on the turf, and repairs are needed so I need to get busy. Hold on now…I won’t be rushing through the door like a black Friday shopper heading for the clearance rack. The ground is saturated as the snow still melts, and I’m sure that the birds (geese especially) would like nothing more than for me to toss out some grass seed for them to gobble up. I’ll assess the damage, put any plowed-up turf (which is pretty much like cut sod) back where it came from like a jigsaw puzzle, and wait a couple weeks for things to dry out and see what comes back from the dead. I’ll try to keep y’all up to date on the progress, but if I don’t, just remember. ..When it comes to turf, green is good. Signs of snow: piles, cones and stakes!